There are applications you can download for your smartphone that can “roll” an arbitrary number of dice with whatever number of sides you could possibly want. It’s faster and easier than throwing physical dice around, and you don’t have to worry about any of them rolling under the couch. No matter how you look at it, it’s really a task better performed by software than hardware. All that being said, there’s something undeniably appealing about the physical aspect of die rolling when playing a game. Luckily, [Paul Klinger] thinks he has the solution to the problem. His design combines the flexibility of software number generation with the small form factor of a physical die. 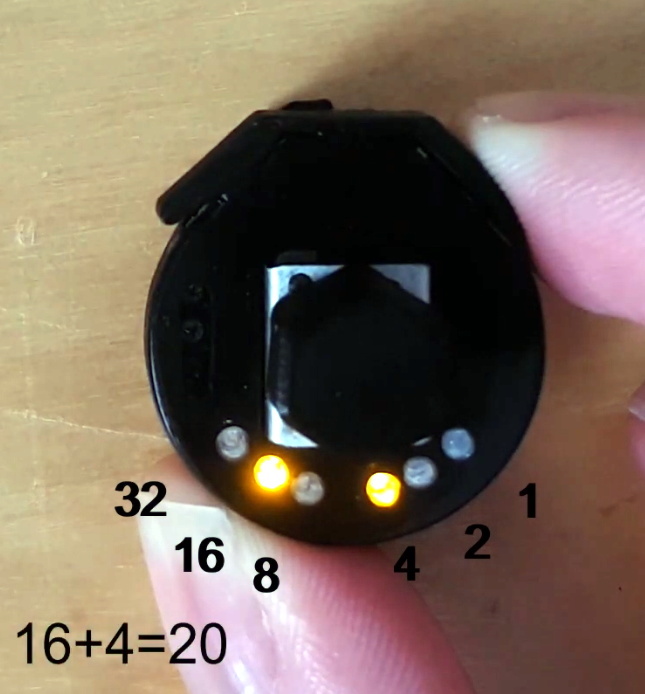 The end result is a tiny gadget that can emulate anything from a 2 to 64 sided die with just 6 LEDs while remaining as easy to operate as possible. No need to tap on your smartphone screen with Cheetos-stained hands when you’ve got to make an intelligence check, just squeeze the Universal Electronic Die and off you go. Granted you’ll need to do some binary math in your head, but if you’re the kind of person playing D&D with DIY electronic dice, we think you’ll probably be able to manage. The 3D printed case that [Paul] came up with for his digital die is very clever, though it did take him awhile to nail it down. As shown in the video after the break, it took seven iterations before he got the various features such as the integrated button “flaps” right. There’s also a printed knob to go on the central potentiometer, to make it easier to select how many sides your virtual die will have. In terms of the electronics, the design is actually quite simple. All that lives on the custom PCB is a ATtiny1614 microcontroller, the aforementioned LEDs, and a couple of passive components. A CR2032 coin cell powers the whole operation, and it should provide enough juice for plenty of games as it’s only turned on when the user is actively “rolling”. We’ve seen a number of very impressive electronic dice projects over the years, and it doesn’t look like the trend is slowing down anytime soon. Of course, if you absolutely must hear those physical dice rolling, we can help you with that too. When you’re debugging a board which has an ESP32, Raspberry Pi, or Arduino, it’s easy to slap on a small LCD display or connect via WiFi to see what’s wrong. At least, that’s what the kids are doing. But what if you’re old-school or you don’t have one of those pimped-out, steroid-filled boards? A resistor and an LED will often suffice. Powering the LED means one thing and not powering it means another. And with seven more LEDs you can even display 0-255 in binary. [Miguel] is clearly in the latter camp. To make debugging-with-LEDs easy, he’s come up with an 8-LED board complete with resistors. He’s even included the Gerber files needed for you to make your own. One row of pins are all connected together and the other row are not. So whether you’re using common cathode or common anode depends on how you orient the LEDs when you solder them in place. You might perhaps have one board of each type at the ready. But who are we kidding? This is just plain fun to have on a breadboard. Show your prototype doohickey to a friend and you know they’ll be drawn to the little binary counter in the corner pulsing 42 or counting down until it starts flashing 255. At risk of getting too feature-rich, you could then add two keys for a binary keyboard or add more LEDs to display 32-bit binary Unix Epoch time and see how long until your friends figure that one out. I don’t mean to toot our own horn, but humans are remarkable for having created numerous numeral systems, each specialized in their own ways. Ask almost anyone and they will at least have heard of binary. Hackaday readers are deeper into counting systems and most of us have used binary, octal, and hexadecimal, often in conjunction, but those are just the perfectly standard positional systems. If you want to start getting weird, there’s balanced ternary and negabinary, and we still haven’t even left the positional systems. There’s a whole host of systems out there, each with their own strengths and weaknesses. I happen to think seximal is the best. To see why, we have to explore the different creations that arose throughout the ages. As long as we’ve had sheep, humans have been trying to count them, and the systems that resulted have been quite creative, if inefficient. By now it might seem like there’s no new way to build a binary clock. It’s one of the first projects many build to try out their first soldering irons, so it’s a well-traveled path. Every now and then, however, there’s a binary clock that takes a different approach, much like [Stephen]’s latest project which he calls the byte clock. The clock works by dividing the 24-hour day into half and using an LED to represent this division, which coincidentally works out to representing AM or PM. The day is divided in half over and over again, with each division getting its own LED. In order to use this method to get one-second resolution it would need 16 LEDs, but since that much resolution isn’t too important for a general-use clock, [Stephen] reduced this to eight. Additionally, since we’re in the Internet age, the clock has built-in WiFi courtesy of a small version of Python called WiPy which runs on its own microcontroller. A real-time clock rounds out the build and makes sure the clock is as accurate as possible. Of course an RTC might not have the accuracy as some other clocks, but for this application it certainly gets the job done.